The Highways Agency’s PFI contract to widen the M25 could have been better value for money. The slowness with which it was taken forward resulted in higher financing costs, and the Agency was slow to investigate a potentially cheaper alternative to widening. "The Highways Agency’s PFI project to widen the M25 could have achieved a materially better value for money outcome. This was partly because the slowness with which the project was taken forward subjected it to the cost effects of the credit crisis. "The Agency should have adopted a more agile approach to procurement, recognizing the potential for making savings using an alternative method of relieving congestion, hard shoulder running. The Agency should have kept its contracting approach open to allow the use of this method." 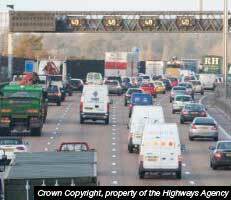 A National Audit Office examination of the Highways Agency’s PFI contract to widen the M25 as a way of reducing congestion has concluded that it could have been materially better value for money. The slowness with which it was taken forward resulted in higher financing costs in the credit crisis. Moreover, the Agency was slow to investigate a potentially cheaper alternative to widening. An 18-month delay in preparing and finalizing the widening procurement meant that the contract was let in May 2009 at the height of the credit crisis. This increased the net present cost of the deal by £660 million (24 per cent) to £3.4 billion. The case for PFI was less convincing than the Agency thought owing to shortcomings in its cost estimation process. The Government had announced in 2003 its intention to reduce congestion on the M25. The Agency was starting to carry out trials at that time of an alternative, potentially cheaper solution of hard shoulder running (allowing drivers to use the hard shoulder at times of peak congestion), first tested in Europe in 1996. Today’s report to Parliament recognizes that, at each stage of the widening procurement, the Agency assessed the value for money of the project based on the information it had available. However, had the Agency investigated hard shoulder running earlier and been more flexible, it could have seriously considered the savings potential that hard shoulder running can offer together with any effect on benefits. The NAO estimates the savings from a conventionally procured hard shoulder running solution might range between £400 million and £1.1 billion. The Agency, however, doubted the technique’s suitability for one of the sections of the M25 being widened which has high traffic flow and whether operation and maintenance savings could be achieved through conventional procurement. The slow progress on testing hard shoulder running, and the Agency’s commitment to widening, meant that the Agency limited its options. As a result, it did not give itself the opportunity to secure a better price for the taxpayer. The Agency is now using hard shoulder running on a number of major roads. The full expected congestion-reducing benefits of the M25 widening project depend on the completion of techniques for managing traffic demand. Despite starting to consider these in 2003, the Agency is still testing their viability in 2010 and does not expect results until May 2012. This creates risks to maintaining the long-term benefits of the project and its potential value in cutting congestion.